ICAR AIEEA Admit Card 2019: The Admit card for ICAR AIEEA UG, PG, and Ph.D. Exams will be available in the month of June 2019, as we saw last year. Candidates have to visit the official website to download the ICAR AIEEA Hall Ticket. In this article, we are providing step by step to download the admit card and some basic guidelines or instruction you have to follow to appear in the exam, without any difficulty, but don’t forget the preparation. The Admit Card will be available one month before the exam. Candidates have to visit the official website or this page to get latest notifications about the exam and admit card. We are providing here ICAR AIEEA Admit Card Date which are tentative and based on previous year schedule. ICAR AIEEA Exam June 2019 4th/ Last week. There are different ways but all meet at same, ICAR Login Page. You will reach at the same and common ICAR login page even trying all the ways, So why not start directly from the ICAR Login Page. Now Enter Login ID, Password, and Security code and then click on Login Button. Find and click on “ICAR AIEEA Hall Ticket” link. Your UG/ PG Admit card will appear. Download the admit card. And take a print out. Only Those candidates will be allowed who possess both ICAR AIEEA e-Admit Card and Aadhaar card or 28 digits Aadhaar Enrolment ID proof or a passport or ration card or driving license or any other valid Govt. Identity card. So make sure to carry one with the admit card. Candidates have to reach the venue at least 1½ hours before the examination to complete to complete some formalities well before the time. The candidate should ensure that the question paper available on the computer is as per his/her choice of Set (PCB/PCM/PCA/ABC) as he/she gave in the application form. 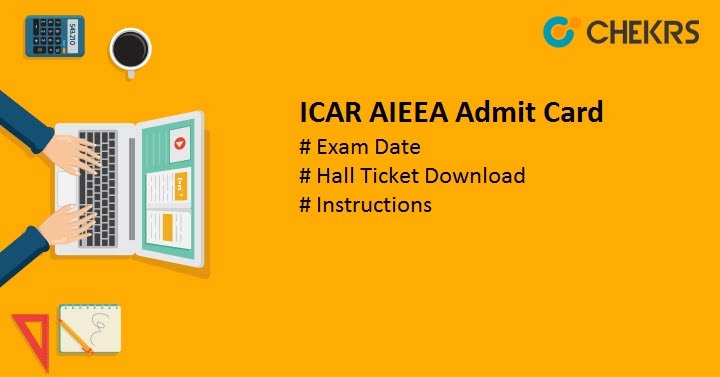 So I hope you will get your ICAR AIEEA Admit Card 2019 easily by following the above-provided steps. We will also suggest you read all the instructions from the official website or e-Admit Card. So now when you get your Admit card, do a quick revision of syllabus in due dates and face the exam with all your confidence, Preparation, and knowledge. Good Luck, Do Well.